This "Historically Speaking" column was published by the Exeter News-Letter on August 12, 2016. Quick, where were the 1916 Olympics held? Trick question – the 1916 Olympics were cancelled due to the outbreak of World War I. The modern Olympic Games were still new, having only been revived in 1894 by Baron Pierre de Coubertin. Exeter’s residents had followed the 1912 games in Stockholm, Sweden, with interest. The Exeter News-Letter, which rarely followed international news, gave the games three large entries over the course of the games, although it should be noted that the Olympics shared the front page with articles like, “Traction Engines Used in Plowing” and “Farmers Day at Hampton Beach.” 1912 was the year of Jim Thorpe, who won both the pentathlon and decathlon events. “James Thorpe, of the Carlisle Indian School, proved himself easily the greatest all around athlete in the decathlon, which provided a variety of tests of speed, strength and quickness” the News-Letter crowed. Thorpe wasn’t the only Native American to represent the United States in 1912 – Andrew Sockalexis, of the Penobscott Nation in Maine, ran the marathon, coming in mere seconds behind the third place winner. The US Team fared well in 1912 – winning more gold medals than any other country, although Sweden was able to nudge us out of first place for total medals. The strength of our team was noted by other countries. Germany, in particular, sent envoys to investigate the American training program, which turned out to be our college athletics programs. Considering this is still our training program for professional sports, the finding isn’t too surprising. Other nations fared better than the US in fields such as equestrian events, which drew participants from military training. The Tug of War competition, an event that was dropped after 1920 but should totally be revived, was comprised of teams from police departments. The Stockholm Police won the tug of war over the City of London Police after two members of the London team dropped from sheer exhaustion. I mean, I’d watch that. Things were looking good for the 1916 Olympics – there was worldwide support, the events were set and the venue chosen: Berlin, Germany. No problem there, right? An extensive new stadium was completed three years before the games were set to begin; a standard later Olympic venues have never matched. War broke out in the summer of 1914 but the games weren’t cancelled on the assumption that the fighting would be over long before 1916. Even as late as 1915, Germany was convinced the games would go off. There was some talk of moving them to the United States, but the IOC refused to move the games without consent from the host country and Germany wouldn’t budge. And, of course, crossing the Atlantic Ocean had become quite perilous what with all the submarine warfare. In the end, the games of the Sixth Olympiad are still credited to Berlin – even though the games never took place. They’re the ghost games – picture a huge empty stadium silent except for the whistling wind and possibly the sound of distant cannon fire. It could have killed the entire Olympic movement. The games returned in 1920, but coverage in the Exeter News-Letter did not. The Olympics were not mentioned at all except for a quick ‘history of the ancient Olympics’ fluff piece – and really, who reads that kind of stuff. 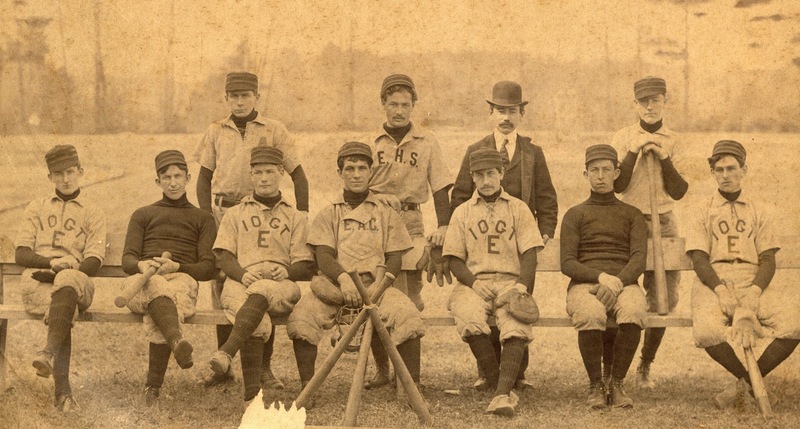 Baseball had taken over the hearts and minds of Exeter’s citizens. It was also an election year, although in all fairness, Olympic years are always election years. But in 1920, the nation was voting to allow women’s suffrage. On August 18th, at the height of the Olympic Games in Antwerp, Belgium, the 19th Amendment was ratified and New Hampshire’s female voters were unleashed on the polls for the primary election a few weeks later. Apparently, no one in Exeter was interested in an international tug of war competition with that type of excitement going on. Photo: Exeter citizens eagerly followed news of the 1912 Olympics, but after the cancellation of the 1916 Olympics interest flagged. 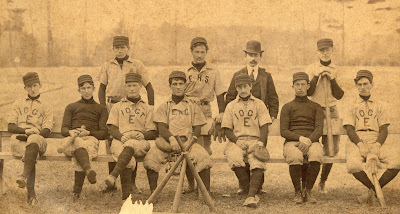 Most residents were far more interested in local baseball teams, such as this Grand Templar team.